The Blue-and-yellow Macaws (Ara ararauna), also known as Blue-and-gold Macaws, are found in the swampy forests of tropical South America. 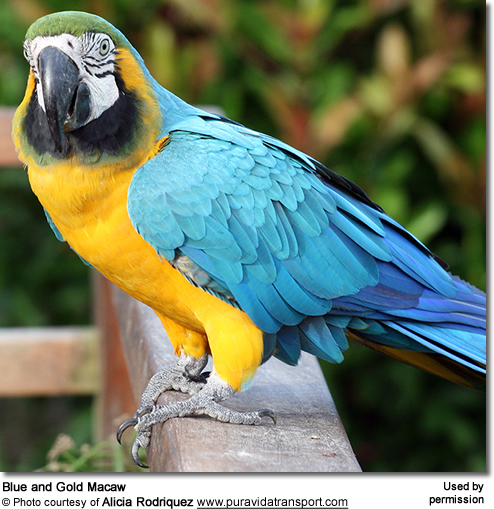 A larger variant from Bolivia is commonly referred to as the Bolivian Blue and Gold Macaw. They are sometimes included in a group commonly referred to as the "Blue Macaws, that comprises the Glaucous Macaws (Anodorhynchus glaucus), Lear's Macaws (Anodorhynchus leari), Spix's Macaws (Cyanopsitta spixii) and the Hyacinth Macaws (Anodorhynchus. hyacinthinus). 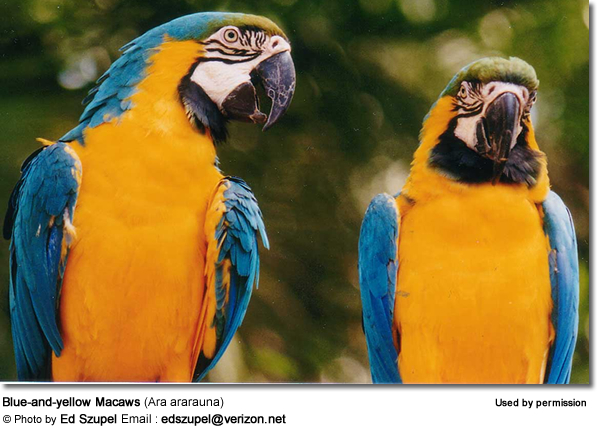 These macaws are the most commonly kept macaw species in the United States. 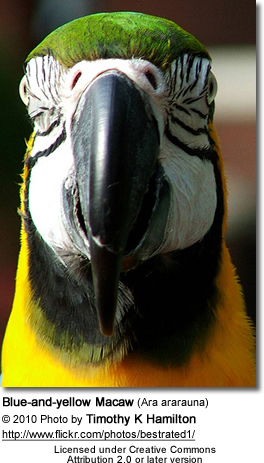 They are fairly easy to obtain as they breed well in captivity, and are, therefore, one of the least expensive Macaws. Their popularity in the pet trade has also had sad consequences. They have become extinct in several areas largely due to the fact that nestlings have been removed from their natural habitats, often resulting in the deaths of their parents as they tried to protect them. Bolivian Blue and Gold Macaw (Ara ararauna [?bolivia?]) [Note: its common English name is also sometimes used for the Blue-throated Macaw] - Not a currently recognized subspecies, but lumped together with the nominate form as one and the same species. May warrant research and possible revision in the future. their larger size. They are said to be bigger than the regular Blue and Gold Macaws; in fact, they are described as surpassing the average-sized Green-wing Macaws and sometimes even some Hyacinths.plumage described as more "true blue" compared to the " green-blue" or turquoise coloration of the regular Blue and Gold. Note: This species is not recognized and the concern has been raised that this race was most likely the result of selective breeding (for size and color). Additionally, it was opined that there was a Blue-throated Macaw in the mix (ancestry). 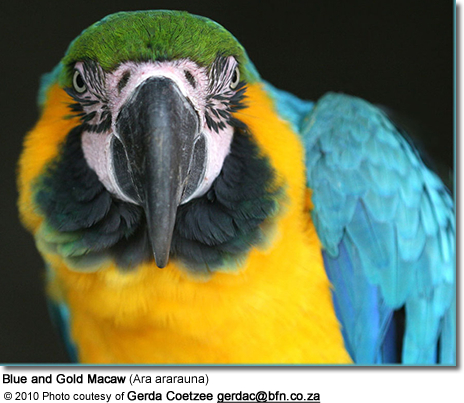 However, the latter doesn't make sense, as the Blue-throated Macaw is actually a little smaller than the Blue and Gold. Therefore, hybridization to create a larger specimen should be unsuccessful. Blue-throated Macaw (Ara glaucogularis, formerly Araninde - suggested: Ara ararauna glaucogularis) - Joseph Michael Forshaw - an Australian ornithologist and one of the world's foremost experts on parrots - stated that this macaw (found in the southern portion of the Blue and Gold's range) could be a subspecies based on their similar appearance. Some physical differences include a slightly smaller size, a less extensive bare facial area, broader black tracings on the cheeks, and a blue throat patch that extends up to the ear coverts (feathers). Note: This race was long disputed mostly because it was only discovered in recent history. 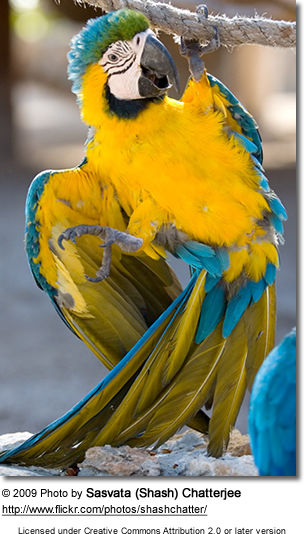 Previously, it was considered an aberrant form of the Blue and Gold Macaw. However, in addition to their physical differences, there are no records of these two races interbreeding in areas where their ranges overlap, supporting the conclusion that these are two different species. 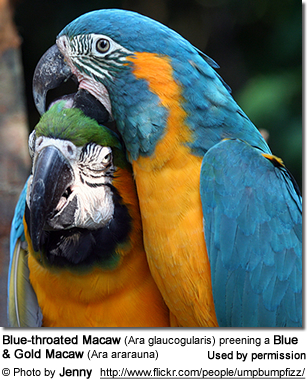 Blue and Gold Macaws have an extremely large range. They occur naturally from Eastern Panama in Central America south through Colombia (except the Cauca Valley and West Narino), east and south to Venezuela, Guayana, French Guiana and Brazil; and east and south through eastern and western Ecuador, eastern Peru and northeastern Bolivia. Formerly they occurred in Paraguay, North Argentina, South East Brazil (last recorded in 1960s), West Ecuador and on the island of Trinidad (Nariva Swamp, last recorded in 1980s). Introduced populations have established themselves in Mexico, Puerto Rico and in Southern Florida (Miami-Dade County). Their declines have been attributed to habitat destruction, overhunting and capturing for the pet trade. They inhabit lowlands up to 1,650 feet (~ 500 meters), making their homes in rainforests, riverside forests, open savannas, marshlands, and swamps. Throughout the day, they are usually seen in pairs or small family groups high up in large trees. However, in the mornings and late afternoons they join large, noisy flocks as they fly to and from their feeding grounds. When alarmed, they usually fly into the air screeching loudly. Their plumage is vividly colored - with a mostly turquoise blue back and bright yellow underparts, although across their range some plumage variations have been noted, as some birds are described as being more orangey below - particularly on the chest. This may be a result of environmental factors, including diet. The blue wings have green tips. The crown and forehead are green. The chin or throat is dark blue to black. The bare face is white, turning pink in excited birds and wrinkled as they age. This bare area is lined with small dark green ranging to black feathers. The large bill is dark grey-black, hooked and strong enough to crush even larger nuts. The beak also comes in handy when climbing around the trees. The dark grey feet are zygodactylous (with 2 toes pointing forward and 2 toes pointing backward) - an adaptation that helps them grasp securely the branches as they perch or move around in trees. The eyes are pale yellow in adults and dark in juveniles. Exciting Mutations of the Blue and Gold Macaw have occurred. Please check out this website for photos. Males and females look alike. However, some suggest that there are some clues - such as males tend to have flatter heads than females and females are said to have narrower beaks. However, these are very unreliable indicators and DNA / Feather or surgical sexing is recommended. Immature birds resemble the adults, but can be identified by their grey-brown eyes. 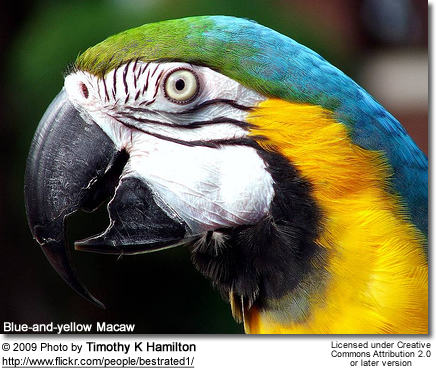 The Blue and Gold Macaw resembles the Blue-throated Macaw . The Blue-throated can be identified by its blue throat patch, reddish facial skin and entirely blue wings. 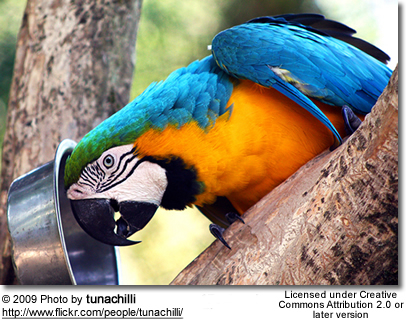 Please refer to image to the right - where a Blue-throated Macaw is featured at the bottom, and the Blue and Gold is above. The differences in the face in particular are quite evident. Their natural diet consists of various seeds, nuts, fruits (particularly the fruits of palms), and possibly some vegetable matter. Their strong beaks are able to crack even the hardest nut shells and crush seeds. They are also commonly observed consuming clay found at riverbanks, which allows them to digest toxins from ingested unripe seeds. 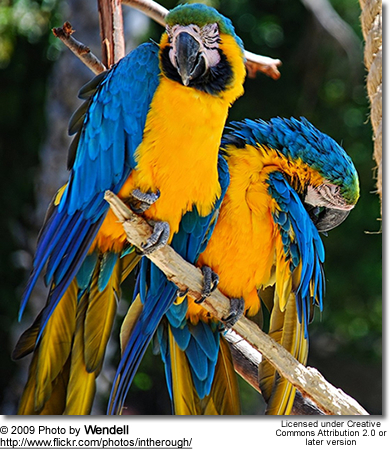 Blue and Gold Macaws reach reproductive age when they are about 3 to 4 years old. Once they have found a suitable mate, they are generally monogamous (paired for life). However, they may replace a mate that they have lost. Most breeding activities occur between January through July (in the United States between March and September). They usually breed every 1 to 2 years. In their natural habitat, they nest in the hollow trunks of dead trees or cavities (natural or excavated by other birds) in tall trees high up to avoid predation. In captive breeding situations, 35-gallon (135-litres) pickle barrels or horizontal nest boxes - sized about 16" x 16" x 48" (41 cm x 41 cm x 122 cm) - have been successfully used. The hatchlings weigh about 0.5 - 0.7 oz (14 - 20 g) and are blind, featherless and completely dependent on parental care. For the first week, the female alone feeds the young through regurgitation and after that time, the male will usually assist. About 10 days later, the young develop feathers .Both parents are very protective of their young and aggressively defend them against intruders. The young fledge (leave) the nest when they are about 90 to 100 days old. By the time they start feeding on their own (wean), they weigh about 35 oz (1,000 g). 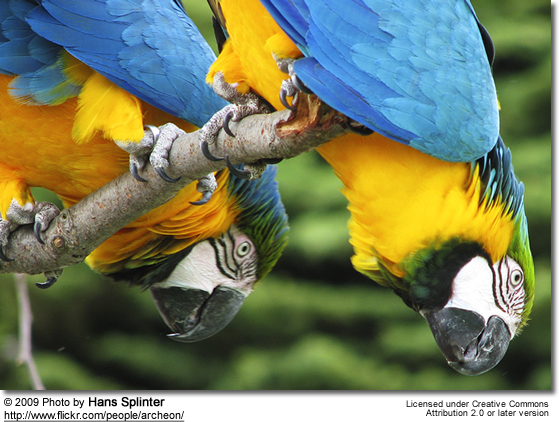 Blue and Gold Macaws are quite vocal, and their contact or flock calls are loud, raucous, and sometimes harsh. Their loud communications are natural parts of their behavior and cannot be trained away in captivity. 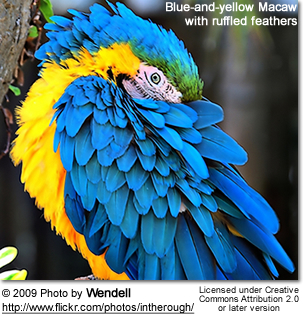 Most resources list as the maximum age of a Blue and Gold Macaw to be up to 60 years; however, some rare birds have surpassed that (please refer to below paragraph). This being said, most only live 30 - 35 years. A female Blue and Gold Macaw named Charlie is reported to have hatched in 1899 and, accordingly, in 2011, she celebrated her 112th birthday. She is said to have once belonged to Winston Churchill. 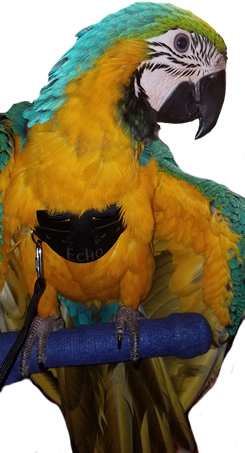 This Blue and Gold Macaw has gained fame for her anti-Nazi cursing. Charlie resides at Heathfield Nurseries, Reigate, Surrey in Great Britain. Maximum age can most easily be achieved by captive birds that are well cared for. In the wild, eggs, chicks and some adults fall prey to birds of prey, such as Harpy Eagles, Hawk Eagles and Orange-crested Falcons, reptiles (snakes, for example) and humans, who hunt them for their feathers and meat. They reach reproductive age when they are 3 - 4 years old, but they rarely produce young after the age of 35.